Analysis: Will Hong Kong Protests End Like Tiananmen Square Did? The 1989 Tiananmen Square massacre is casting a shadow on pro-democracy "Umbrella Revolution" protests roiling Hong Kong. Hong Kong’s leader has defied calls to step down and police are warning of “a firm response” if the demonstrators occupy or block more government buildings, evoking memories of the lead-up to Beijing’s brutal crackdown 25 years ago. So is the turmoil unfolding in Hong Kong’s streets likely to end in a similar charge of Chinese troops and tanks, and the resulting bloodbath that left hundreds dead? There are some striking similarities between the two movements. For both protests, the timing was bad. Smart, articulate and idealistic students seem unlikely to wrench democratic concession from the hands of strong and nationalistic leaders in Beijing, be they Deng Xiaoping back then or Xi Jinping today. Both demonstrations began modestly with a few thousand participants, but erupted in angry reaction to the government’s hard-line response. In April 1989, it was a caustic, front-page editorial in the “People’s Daily” that chastised the movement as an anti-government “revolt” that antagonized the protesters. The next day about a 100,000 more students marched to Tiananmen Square. In Hong Kong, tear gas and pepper spray fired by riot police on the biggest protests since the former British colony was handed back to China in 1997 outraged many and swelled the protesters’ numbers. In both Beijing and Hong Kong, authorities opted for a "wait them out" strategy, expecting that students would tire and eventually go home. In Tiananmen, that almost worked. By the third week, the massive square had filled up with dumpling wrappers, water bottles and other garbage. Public toilets were overflowing. Students, bored with their protest chants and songs, were leaving in throngs. Then one student leader launched a hunger strike. Another decided to build a 33-foot-high "Goddess of Democracy" statue out of foam and papier-mache. By the end of week four, more than 300,000 re-energized protesters packed the square. Deng declared martial law and was about to secure the square with the People’s Liberation Army. Fast-forward 25 years and another scathing editorial appears in the People’s Daily. On Wednesday, the newspaper blamed Hong Kong protests for damaging the city’s stability and prosperity, saying they would have “disastrous consequences” on the local people. Still, there are many reasons to think that Hong Kongers can avoid the nightmare of June 3 and 4, 1989. In 1989, the communist leadership was split between those who sympathized with the students and hardliners who feared civil war. In addition, the protesters’ demands were often unclear and sometimes contradictory. Finally, Beijing in 1989 had the ability to pull the plug on communications with the outside world. Hong Kong protesters are united around two specific demands — the resignation of their Beijing-appointed leader, Leung Chun-ying, and the ability to choose that leader without government intervention. Meanwhile in Beijing, the government is united around Xi, who knows that any crackdown on Hong Kong protesters will be seen by the world in real time. So the pressure is on officials in Hong Kong and Beijing to find a compromise. “Unless there’s some chaotic situation, we won’t send in riot police,” an unidentified Hong Kong government source was quoted as saying by Reuters. “We have to deal with it peacefully, even if it lasts weeks or months." John Delury, a professor and author of “Wealth & Power: China’s Long March to the Twenty-First Century," agrees that Tiananmen history is unlikely to repeat itself in Hong Kong. “I am still not so pessimistic to think this will end in massive state force," he said. "But that said, I don’t see the compromise position, and I can’t envisage the [Communist] Party backing down." The situation is on a knife’s edge and what happens next may depend on meetings between protesters and Hong Kong’s leader. 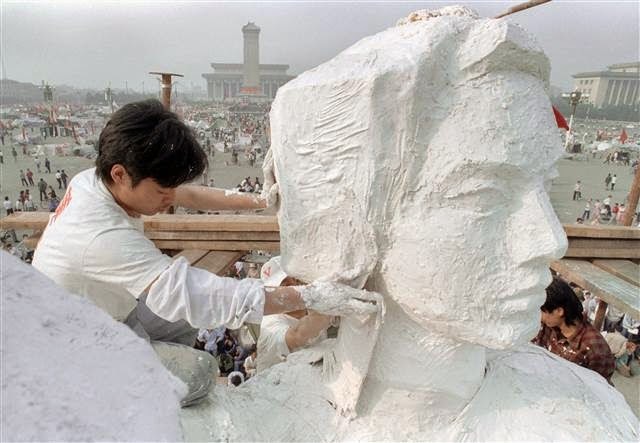 In late May, 1989, many exhausted students on Tiananmen Square refused to believe that they were in mortal danger, saying half-jokingly that the "Goddess of Democracy" gave them strength. That was almost seven weeks into their protest, and just days before the deadly crackdown.